If you aren't bullish on stocks, why not? This one chart suggests that you should be interested in buying the biggest stocks in the world. Forget buying Dow stocks in the wake of the vicious market correction, the S&P 500 is where the real value is right now. 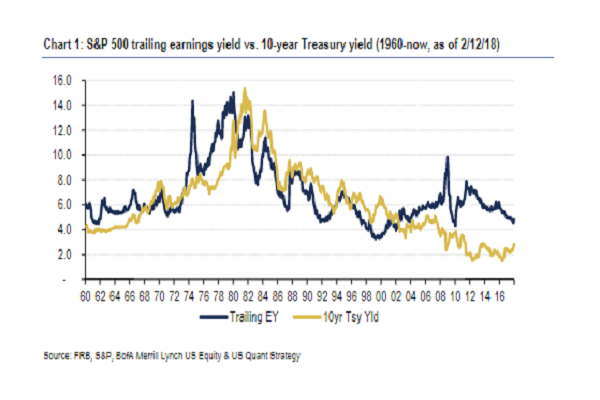 Rising interest rates has led to a narrowing gap between earnings yields and bond yields, as shown in a Bank of America chart below of the S&P 500 trailing earnings yield and the 10-year Treasury yield. But, equities still remain relatively more attractive on this measure, Bank of America says. BofA also calls out the S&P 500's price-to-earnings multiple as too attractive to overlook at the moment. "Since the end of January, the S&P 500 forward price-to-earnings multiple has fallen from 18.1 times (just off the 15-year high of 18.3 times) to 16.6 times, driven by a lower numerator (falling price) as well as a higher denominator (surging earnings per share forecasts on tax reform)," BofA notes. "This represents a more modest 9% premium to its historical average (15 times), and its lowest level since Oct. 2016." Bofa believes there are more industry opportunities for investors to consider than at any other time during the latest bull market. The most attractive sectors include trading companies and distributors, metals and mining, airlines, consumer finance, banks, specialty retail, air freight and logistics and media. Action Alerts Plus has several holdings in these areas such as Nordstrom (JWN - Get Report) , Citigroup (C - Get Report) , Goldman Sachs (GS - Get Report) , JPMorgan (JPM - Get Report) , and Comcast (CMCSA - Get Report) .